ROCKINGHAM FLYSCREENS HOME SECURITY ROCKINGHAM, BALDIVIS HOME SECURITY FLYSCREENS CUSTOM MADE SECURITY DOORS AND SCREENS. SERPENTINE FLYSCREENS HOME SECURITY DOORS AND SCREENS, PORT KENNEDY FLYSCREENS SECURITY DOORS AND SCREENS, KARNUP HOME SECURITY DOORS AND WINDOWS. FLYSCREENS CUSTOM MADE HOME SECURITY WINDOWS AND DOORS GOLDEN BAY, SECRET HARBOUR SECURITY DOORS AND SCREENS, FLYSCREENS WELLARD, FLYSCREENS SUPPLIES AND INSTALLED ROCKINGHAM, GOLDEN BAY FLYSCREENS, CUSTOM MADE FLYSCREENS ROCKINGHAM, CUSTOM MADE FLYSCREENS ROCKINGHAM SECURITY DOORS & SCREENS PORT KENNEDY, SINGLETON FLYSCREENS. Quality Products, Reliable Service, Locally Owned and Operated. Flag Poles Available. Pet Doors. ROCKINGHAM FLYSCREENS MANDURAH. 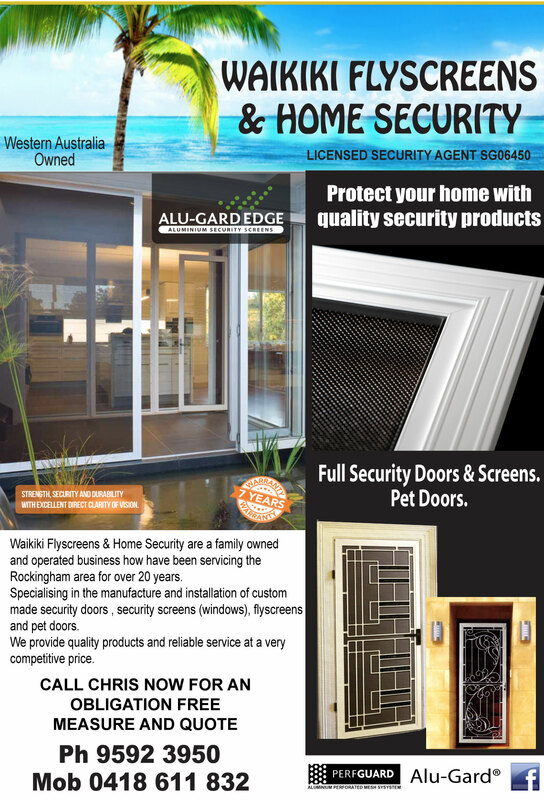 ROCKINGHAM SECURITY DOORS & SCREENS MANDURAH. ROCKINGHAM FLAG POLES MANDURAH. ROCKINGHAM PET DOORS MANDURAH.